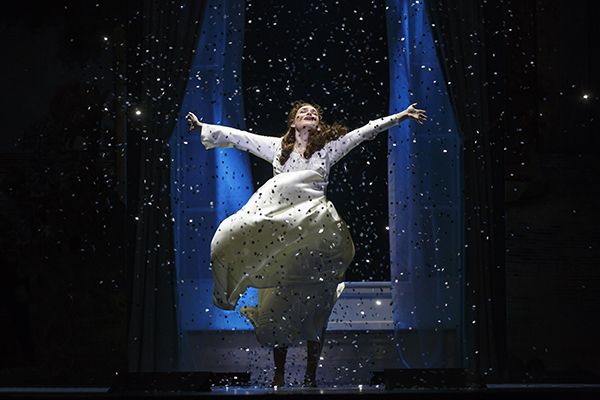 Like the oft-beloved movie of the same name, “Finding Neverland,” is “inspired” by the tale of how J.M. Barrie came to write “Peter Pan.” But an adaptation must stand on its own merits and this well produced and performed musical does just that. The leads are all strong in presence and voice. Billy Harrington Tighe, as the charming Barrie, develops an instant rapport with the audience, as a talented man facing not only writer’s block but a crisis of self as well. He is afforded a number of powerful musical numbers like “My Imagination,” “Neverland” and “Stronger.” John Davidson (remember him from “That’s Incredible!” and many game shows?) gets to shine in 2 roles, that of theatrical producer Charles Frohman and the scoundrel Captain Hook. Disappointingly, he is never really given a true solo number, but certainly makes the most of his supporting role. He has a formidable stage presence and mischievous gleam in his eye. As Sylvia, mother to Barrie’s muses, Christine Dwyer’s beautiful voice and playful demeanor are an irresistible combination. Also included in the delightful cast are 4 scene-stealing young boys (in rotating roles) and one very shaggy dog. Original Broadway director Diane Paulus has multiple Tony Awards to her name and, as befits a show centered strongly on the virtues of imagination, the production is inventive and visually unique. Although set in the early 1900’s, some very modern flourishes, like video projection, are employed to magically enhance the proceedings. Lighting, glitter, and slight-of-hand add to the wonder. Even the music, by 2 members of a 90’s British pop group, is traditional Broadway but embellished with a pop sensibility. But it is the choreography of Mia Michaels that truly soars. Just as flying is a key motif in Peter Pan, so too, is the use of horizontal space in the dancing. Whether climbing up tables, or being lifted in the air, there seemed to always be a performer “up there” during the big numbers, like ‘Play.” “Welcome to London” included a truly unique staccato movement . The nightmarish “Circus of Your Mind” was visually stunning, creating a carousel with a few unique props and use of light. Like “Peter Pan,” there is a melancholy to “Finding Neverland,” with the passage of time a strong underlying theme. But this singularly unique spin on a familiar tale seemed to make audience members young and old feel like they stopped growing up, at least for a few hours.